Often the most satisfying walk is over two days with a restful night between. A distance of 30-50km gives the sense of real exploration and the body has a good work-out to justify hearty meals. It’s also good to get away for a couple of days – a complete change of scene without breaking the bank. Here are three very different suggestions for enjoying a two-day walk in Brittany. Options 1 and 3 involve carrying an overnight pack. This island is accessible from Lorient (south coast) with a boat trip of about 45 minutes. 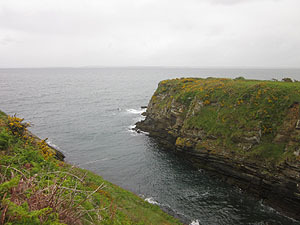 It has a beautiful green landscape with varied coastline of low cliffs and beaches. None of the walking is very demanding but the seascapes alone are worth the trip. 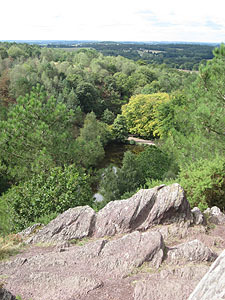 This deep forest north-west of Rennes is associated with the legends of Merlin and Lancelot. Allow time to visit the Arthurian centre at the Château de Comper if you like that sort of thing. Otherwise just enjoy some glorious scenery of woods, rivers and lakes with many Neolithic remains dotted about. Two separate day walks work fine here, so no need to carry overnight things. The best base is Tréhorenteuc, where there’s an excellent tourist office (www.valsansretour.com) and various options for accommodation. On the first day explore the Valley of No Return and the haunts of those Arthurian fairies Morgane and Vivienne on a circuit of about 15kms (Vallées et bois de Rauco in the French Topoguide for this area) from the church (don’t miss this) in the village, and adding a very short detour to see the purple schist façade of the fabulous Château de Trécesson. For your second day, try a 13km circuit to the north of Tréhorenteuc, taking in the strange Neolithic monument called Le Jardin aux Moines. Then drive on to nearby Paimpont to visit the famous abbey and follow a 5km circuit past the grotto or just stroll by the lake. There are plenty of good places to eat in this attractive lakeside village. Right in the heart of Brittany, this huge lake created in the 1920s offers a circuit of 40kms, perfect for a two day break without too much hurry – time to swim or have a leisurely lunch pause each day. One or two ups and downs along the way, so more than a casual stroll, but not too demanding. 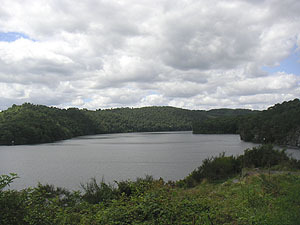 The northern route passes Beau Rivage with refreshment options (or in Caurel one kilometre uphill), whilst the southern shore is wilder, with paths passing through the Forêt de Quenécan (diversion in force in hunting season). The Anse de Sordan has a restaurant and beach here. There are accommodation options at the western end in Bon Repos (BWs can recommend the hotel here – www.jardinsabbaye.fr) or with more choice at the opposite end in Mur-de-Bretagne, where the tourist office can provide a free detailed leaflet for this circular walk with a good map included.